Sea of Thieves has had an interesting trajectory since its launch about a year ago. In our review we admired the undeniable creativity that surfaces when you and a handful of friends play pirates together in a virtual setting, but there just wasn’t much there in terms of content. 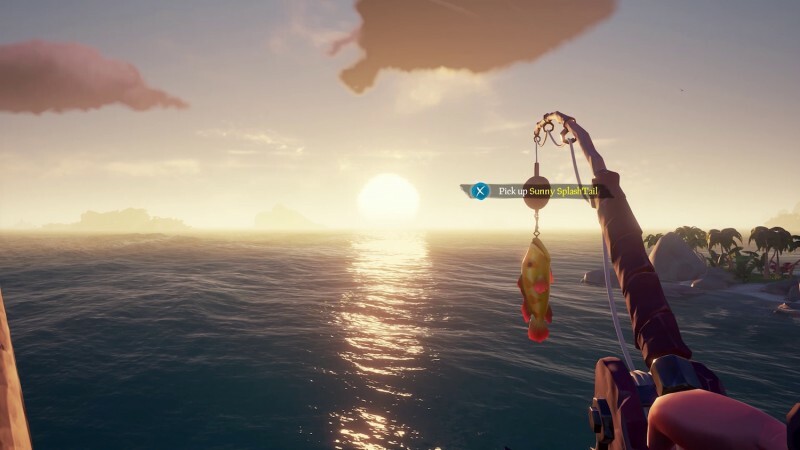 Since that time, Rare has added patches, items, and missions, and the community has been appreciative as the game maintains a steady and impressive player base. For its one-year anniversary update, Sea of Thieves is getting its biggest content boost yet. 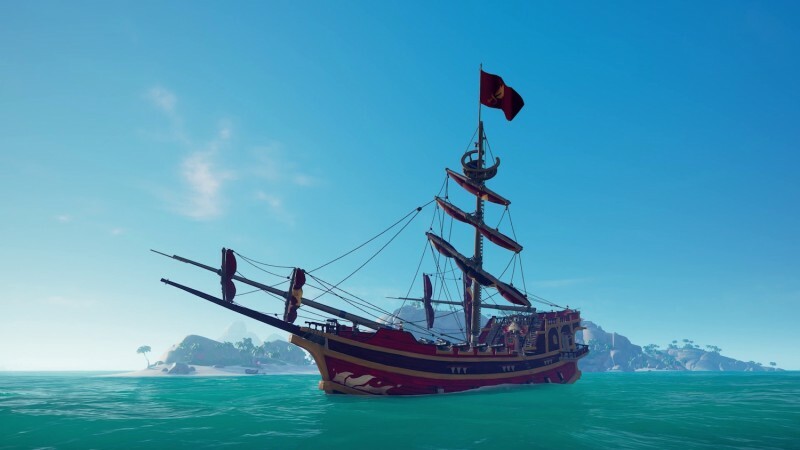 We spoke with executive producer Joe Neate about what is in the free update that arrives on April 30 and what the future of Sea of Thieves looks like as it sails into year two. Adventure mode is Sea of Thieves’ main mode. It’s the one you’ve been playing since launch and it’s finally getting story content – with cutscenes and everything. “We think there is a real opportunity to have more crafted narrative and story in that shared world,” Neate says. The story missions are called Tall Tales. “There’s a real ’80s action-adventure vibe, like Indiana Jones or The Goonies,” Neate says. When the mode is live, you and your friends will be able to talk to the mysterious stranger, and there will be a book next to him that you can all vote on to play together, and then the stranger will talk to you and set up the story. “He’s animated. He’s professionally voice-overed. No more Rare employees doing this stuff. We’ve gone all in on proper voice actors,” Neate says. You will be in full control while the stranger speaks, but he will be telling a story. “It’s kind of like Half-Life,” Neate says, in terms of how the story is delivered. 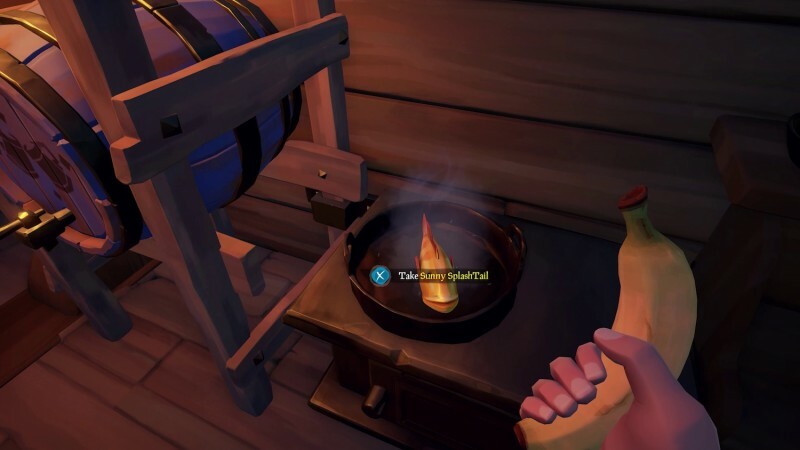 More Rare In Sea of Thieves? Arguably the biggest addition coming as part of the anniversary update is the Arena. The arena can be entered when you boot up the game, and it offers an expedited competitive mode that up to five teams of up to four-player crews can participate in. It’s meant to be a shorter, more digestible version of Sea of Thieves. “If you’ve going to play you need to have some time set aside, like up to half an hour, to really achieve anything,” Neate says. The mode starts off with up to 20 players all in a cabin that serves as a social hub. Neate says the cabin will have multiple levels have things like a hot tub, stage, and other random things to play around with. No one can use weapons in the cabin, though. Once situated you will talk to a new trading company, the Sea Dogs, who will send you on your way. Matches take 24 minutes (the length of a day/night cycle of Sea of Thieves) and in that time you have to collect as much silver as possible in a specially selected portion of the map that will typically be made up of five to eight islands. “We picked spots that have a concentration of islands that are all interesting, and we just bring in the Devil’s Shroud around the world,” Neate says. Everyone gets the same maps, so it’s up to you how you want to pursue the silver. 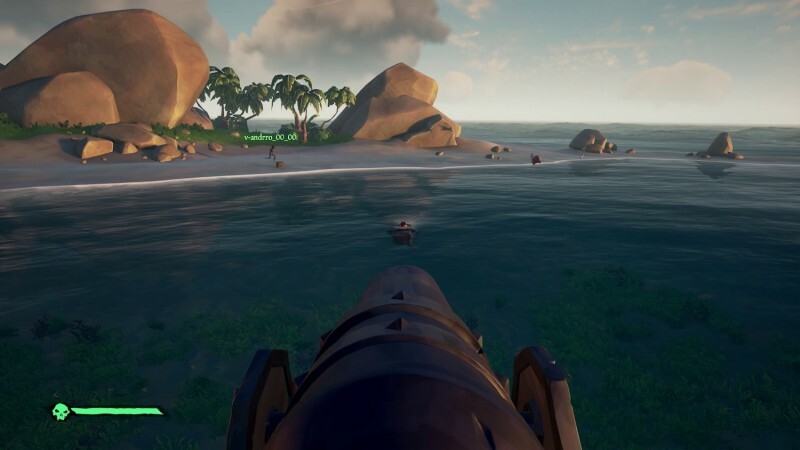 You can take on the other teams and try to take their treasure or defeat them, or sneak off to an island no one is currently pursuing. There are penalties for death, and rewards for defeating others and delivering chests. “If your ship sinks you lose like 1,000 silver, that’s a real big penalty,” Neate says. It’s a much faster paced version of a familiar game. At the end the match, your silver is counted to see who wins and you are awarded experience and gold based on your placement. That gold can then be used to purchase exclusive stuff from the Sea Dogs trading company, or in your Adventure campaign. Along with the Sea Dogs trading company in Arena, the Hunter’s Call trading company will be added to the Adventure mode. Hunter’s Call wants fish and assorted meats from you. You know how to get the meat already – that comes from the pigs, chickens, and snakes, as well as the kraken and megalodon shark you defeat. 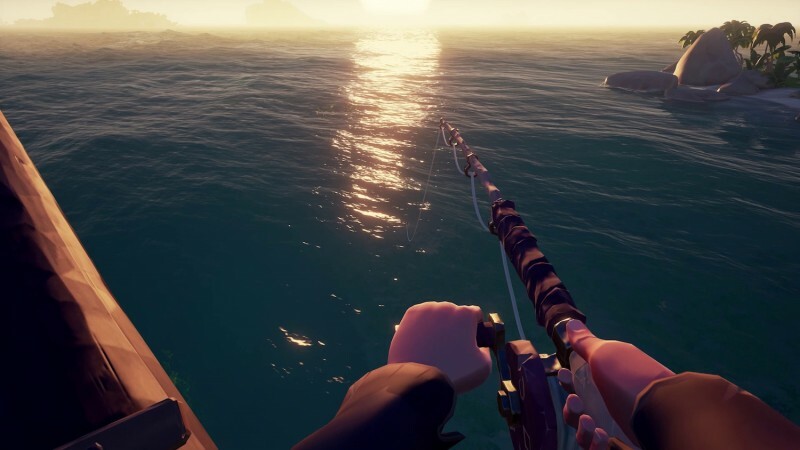 Fishing, however, requires a fishing rod, which you get as part of the update. You can fish from anywhere as long as you’re dropping your line in the sea. There will be 50 different types of fish, and catching them depends on factors like time of day, location, and what type of bait you’re using. There are no quicktime minigames or on-screen prompts related to fishing. You just have to pay attention. 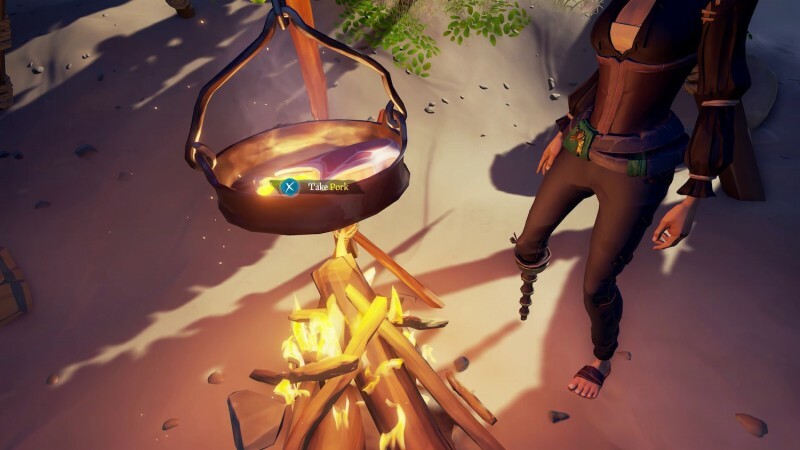 If you don’t turn in your meat and fish to Hunter’s Call, you can cook it over fires or on your ship, and if you cook it well (don’t burn it or undercook it) eating it will give you bonuses, like regenerating health for a period of time. The update also adds two harpoon guns to the front of your ship, and they have all kinds of uses. 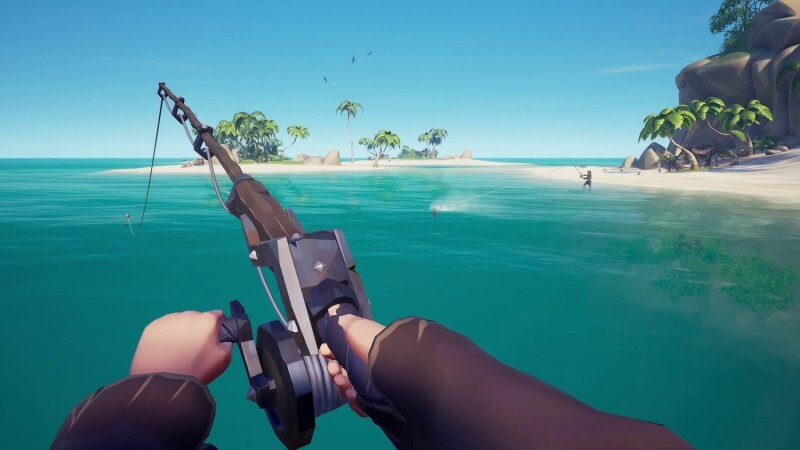 You can use them to attach your ship to others, or attach it to a tree or rock to pull off a handbrake turn, or attach it to the megalodon shark to get pulled along at high speed. You can also harpoon floating barrels out of the ocean and pull them up on to your deck, which is something you can also do with treasure chests and other players. Neate says it is difficult, but if your aim is true, you can harpoon a treasure chest right out of another players’ hands. The harpoons also play into more damage options for your boat. The harpoon or cannons can damage things like a ship’s mast. 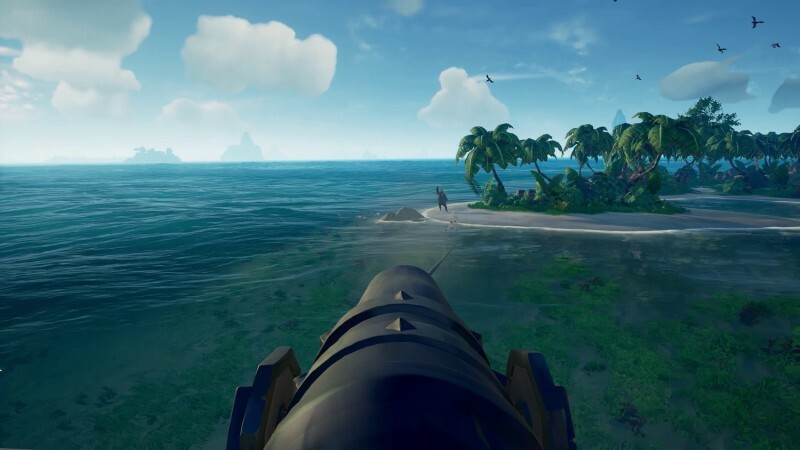 If the masts gets hit with three canon balls, it will come down and players must pull them back up with ropes and use three planks to repair them. The anchor and wheel can also be damaged individually, too. Will There Ever Be RPG Elements? As it is still in the planning stage the future is a little vague, but there are some things Neate knows for sure, like pets. “We will be introducing monetization elements in terms of things people can pay for optionally. Pets is going to be one of those first examples,” Neate says. “We want to offer optional ways for people to invest in the game that they love and for things that they will love that are fun and social cool things, but don’t bring power or any kind of advantage to people. Pets is a fun companion. If you buy one, but no one else in your crew does, they can still play with it. It will be on the ship, they can mess around, you can pick it up and fire it out of a cannon… because you can fire pets out of cannons. 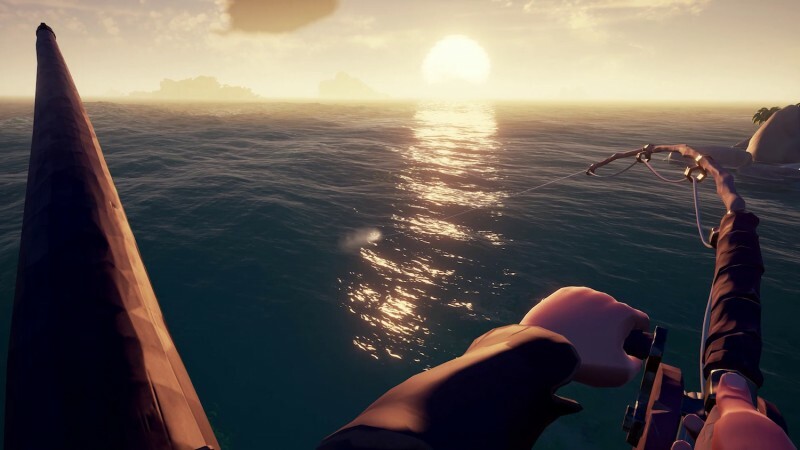 It’s funny.” Neate is adamant about the monetization and says if you are spending money on Sea of Thieves (outside of buying the game itself or being a Game Pass subscriber) it will never be for anything that gives you additional power. “We will never charge for things that will split players. There wouldn’t be a set of stories we’d charge for that only the people who’ve payed can play because that would just separate our play-base, and that would be super weird,” Neate says. For our review of Sea of Thieves, head here.